The CIMSS Saharan Air Layer (SAL) product (above; click image to play animation) showed a large pocket of SAL (yellow to red color enhancement) drifting westward over the far western Atlantic Ocean and toward the Gulf of Mexico on 28 August 2014. On GOES-13 0.63 µm visible channel images (below; click image to play animation), the hazy signature of the SAL dust could be seen surging westward, not far to the south of Category 1 intensity Hurricane Cristobal. The SAL also exhibited a warm/dry signature (yellow to orange color enhancement) on the corresponding GOES-13 6.5 µm water vapor channel images (below; click image to play animation). At 17:16 UTC, a Suomi NPP VIIRS true-color Red/Green/Blue (RGB) image from the SSEC RealEarth web map server (below) showed that Hurricane Cristobal had developed an eye formation. A comparison of AWIPS-2 images of Suomi NPP VIIRS 0.64 µm visible channel and 11.45 µm IR channel data (below) revealed that the coldest cloud-top IR brightness temperatures (-77º C, lighter gray color enhancement) were located within convection just southwest and southeast of the eye. GOES-13 is currently in Autumn Eclipse Season, when the Earth-Satellite-Sun geometry means that solar energy can reach the satellite sensors directly. NOAA NESDIS has software to mitigate the effects of Stray Light in the Sensor Processing System (SPS) that transforms the raw GOES Imager data to navigated and calibrated (GVAR) data. However, earlier this month, the SPS at Wallops inadvertently omitted the Stray Light Correction. The animation above, from 16-27 August, shows how Stray Light intruded into the 3.9 µm imagery on the GOES-13 Imager; on 25 August the Stray Light Correction was turned back on, and the final two images show no major Stray Light effects over the satellite view (Stray Light is still recorded in outer space). The animation above is for 5:15 UTC, when Stray Light affected the eastern part of the full disk scan. At 4:45 UTC, Stray Light affected the western part of the disk, and at 05:00 UTC, the central part of the disk. Click here for more about the Stray Light Correction. 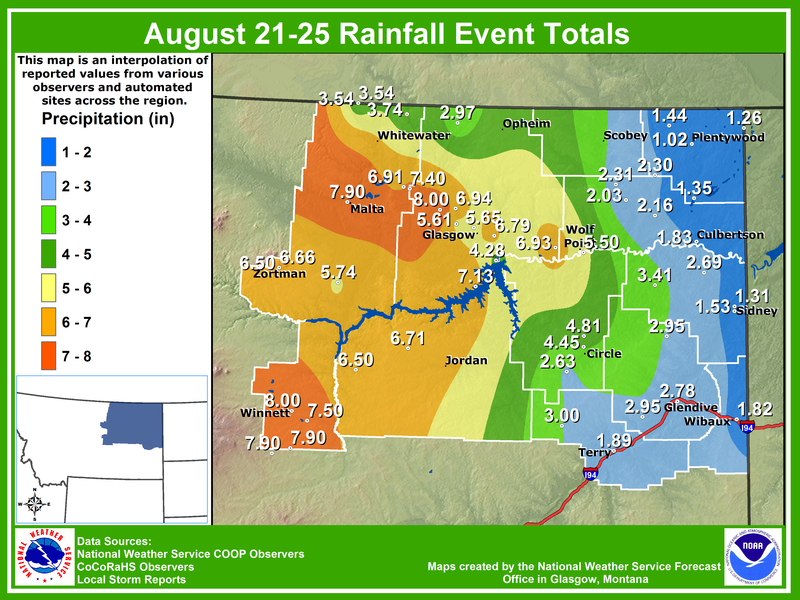 Some locations in northeastern Montana received up to 7-8 inches of rainfall over a 5-day period (NWS Glasgow rainfall map), which led to flooding in many areas. A comparison of before (12 August) and after (26 August) 250-meter resolution MODIS false-color Red/Green/Blue (RGB) images from the SSEC MODIS Today site (above) showed the areal extent of flooding (cyan to darker blue areas on the 26 August image). The RGB images use MODIS bands 7/2/1 to help highlight the areas of of floodwater. The maps below show the total observed rainfall, the departure from normal, and the percent of normal for the 7-day period ending on 26 August. The GOES-14 satellite was in Super Rapid Scan Operations for GOES-R (SRSOR) mode, providing 1-minute interval images of Category 4 intensity Hurricane Marie over the East Pacific Ocean on 25 August 2014. Even though the eye was cloudy, the 1-minute imagery revealed a number of mesovortices circulating within the eye of Hurricane Marie (above; click image to play YouTube video). Note: the YouTube video is best viewed in Full Screen mode, and clicking on the “Gear” icon to select “1080p HD”. On the previous day, the eye was less cloudy and mesovortices were more easily seen on GOES-15 0.63 µm visible channel images (below; click to play Animated GIF); however, the GOES-15 images were only available at the routine 15-minute interval, which made tracking the evolution and motion of the mesovortices more difficult. On this day (24 August) Hurricane Marie had rapidly intensified to a Category 5 storm (plot of CIMSS ADT).